NORTH CAROLINA -- Residents of Clarkton in Bladen County say they're shocked after hearing horrifying stories about a nine-day-old baby being mauled to death by the family dog. Investigators say a nine-day-old infant was killed Tuesday afternoon at a home in Clarkton. At this time, the sheriff's office and district attorney will not say much, but investigators say five dogs were removed from the home and may have been involved in the baby's death. 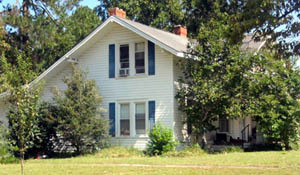 Betty Pate lives across the street from where the child died. She says she saw the baby's mother's reaction. "When she came out, or when she heard the baby crying, and came out the door, the dogs had the baby," Pate said. She says the two dogs she saw the most were a pit bull and a rottweiler. 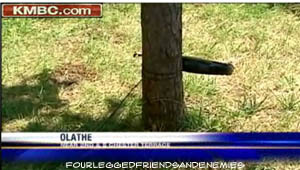 "You never saw them in the yard," Pate said. "You never saw them out running around, so they must have been dogs that stayed in the house with them." We went by the Bladen County Animal Shelter where all five dogs from the home are being kept. We were told that we would not be able to get pictures of the animals because of the pending investigation. We also attempted to speak with the family at the home, but we were told no comment, and then they began throwing rocks at us, so we left. So far no charges have been filed in the case. OHIO -- A Streetsboro man who allegedly allowed his two pit bulls to run loose in July on Greenwood Road in Rootstown, where they fatally mauled another dog and injured its owner, has been indicted by a Portage County grand jury on six felony and misdemeanor charges related to the attack. John T. Dunn, 35, of 9007 S.R. 14, was indicted Aug. 12 on two counts of failure to confine a dangerous or vicious dog, both fourth-degree felonies; failure to obtain liability insurance for a dangerous or vicious dog, both first-degree misdemeanors, and failure to register a dog, both minor misdemeanors. Dunn was booked Aug. 25 at the Portage County jail and releasted on a personal recognizance bond. His first court appearance will be at an arraignment hearing at 11 a.m. Sept. 12 in Portage County Common Pleas Judge Laurie Pittman’s courtroom in Ravenna. 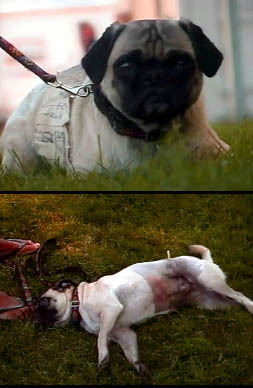 The grand jury alleged that as the owner of a breed of dog deemed dangerous or vicious by state law, Dunn failed to keep his dogs chained up, penned in or muzzled, failed to register the dogs with authorities and did not purchase an insurance policy carrying $100,000 liability coverage in the event the dogs injured or killed someone, as required by state law. The fourth-degree felonies carry a potential sentence of up to 18 months in prison. First-degree misdemeanors are punishable by up to 180 days in jail and $1,000 in fines each, while the minor misdemeanors could net $100 in fines apiece. Dunn’s pit bulls, a male named Brutus and a female named Sable, allegedly were running loose in the 4700 block of Greenwood Road on July 15 when they attacked Marie Hustead’s 2-year-old cocker spaniel Lucky as she walked him in her front yard. 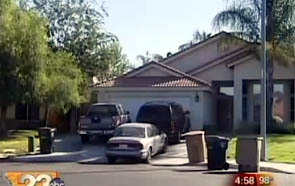 It is believed Dunn is in a relationship with someone living on that street, which is why the dogs were in the neighborhood. Lucky was fatally mauled and had to be euthanized. 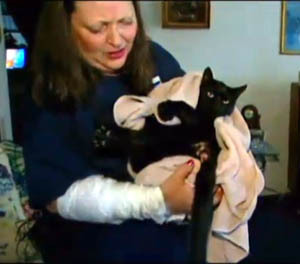 Hustead, 70, suffered injuries to her hands and arms trying to save Lucky and received approximately two dozen stitches. The Portage County Dog Warden’s Office investigated the incident and filed charges. Dunn’s prior criminal record is limited to a misdemeanor illegal fireworks charge filed in December 2010 by the Portage County Sheriff’s Office. He pleaded guilty to that charge in April and paid $337 in fines and court costs, according to court records. COLORADO -- The man who shot and killed a neighbor’s pit bull in Evans while it was attacking his own dog won’t be charged in the shooting. The pit bull had been previously cited for attacking otherdogs, and the dog’s owner, Robert Delarosa, had been previously cited for the dog’s behavior. At around 10 a.m. Monday, authorities were dispatched to the 3000 block of High Drive on a report of a pit bull dog that had escaped from his yard, jumped a fence and attacked another dog in its own backyard. When officers arrived on scene they found a pit bull that was fatally shot by the owner of a shepherd mix dog that was attacked. The man who shot the dog says he attempted to separate the animals and had to shoot at the pit bull to save his dog. Delarosa’s roommate says he let the pit bull, ‘Deuce,’ out to the backyard to go to the bathroom when the attack happened. Chief, the shepherd mix, sustained minor puncture wounds to the chest area, front legs, and the rear thigh area. "I'm pretty hurt about it,” says Delarosa. “That was my dog. I had it for years." Delarosa says the dog’s personality changed recently after a deadly fight with a coyote that got into their backyard. He says Deuce got more aggressive. In July, Delarosa was cited after Deuce and another pit bull were seen running loose from his premises. On August 5, he was cited when Deuce excaped from his backyard and attacked a small male beagle that had sustained wounds to the face, ear, and legs. On August 9, Deuce once again attacked another dog. 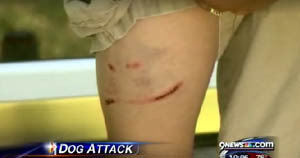 That attack happened to a dog that was on a walk with his owner. do something about this pit bull?! "I kicked at him. There was just nothing. It was the most hopeless feeling I've ever had," says a former neighbor of Delarosa, who didn’t want to be identified. She says Deuce attacked her and her beagle as they walked on the sidewalk outside his home in the 3400 block of 15th Ave.
Delarosa had moved to a different address when the most recent attack occurred. He was cited with unlawful ownership of a dangerous dog. Victims say something has to change to get dangerous dogs off the street. “This certainly has caused me to review our current process. I think we can do things to make it a little better, with a little more teeth,” says Evans Police Chief Rick Brandt. He says they will work to get dog owners in front of judges more quickly—before their dogs are released form mandatory quarantine. Deuce had been released twice from quarantine. Brandt says they’ll also clarify when a dog is considered vicious. During the first attack, the animal control officer only charged Deuce as a nuisance animal. Delarosa is due in court Sept. 8 to answer to multiple animal violation charges. PENNSYLVANIA -- Elizabeth Township police are investigating after a deadly dog attack. Pamela Cassin told Channel 11's Gordon Loesch that she and her two young children were standing at a bus stop at the corner of Smithfield and Willis Streets in the Boston neighborhood, when a neighbor's two rottweilers attacked them. "I turned around, and the dogs were charging at me and my two kids," Cassin said. 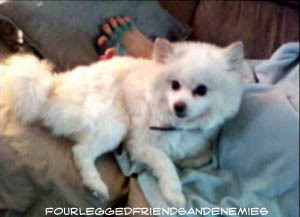 The Cassin's 5-year-old Pomeranian dog, Caesar, was killed. "When they got the dog, and killed the dog, then they started chasing us. They weren't letting up," Cassin said. The two Rottweillers somehow opened a door, got out of a five-foot fence and chased the family. The owner, Bill Proneiker, said it was an accident. He said his dogs are not normally aggressive. "I'm very sorry. My family is very sorry," said Proneiker. Elizabeth Township police and the dog warden are investigating the incident. The Rottweilers are under a 10-day quarantine and charges will be filed against the owners for harboring a dangerous animal. PENNSYLVANIA -- Homicide detectives are investigating the death Tuesday of a 50-year-old North Philadelphia woman, who, according to her husband, was killed by the couple's pit bulls. The woman, whose name was not released, suffered "severe head and face injuries, and that appears to be the cause of death," said Chief Inspector Scott Small. The manner of death, whether by attacking dogs or "man-made," will be determined by an autopsy Wednesday, Small said. After an initial investigation in the home, the Medical Examiner's Office cannot say for sure, Small said. The husband and another man were handcuffed and taken away to be questioned by detectives. At 6:30 p.m., the husband called police and said he had come home from work and found his wife dead in the first-floor living room, Small said. The husband said his wife had been killed by their dogs, Small said. The wife was pronounced dead in the rowhouse, in the 400 block of West Carey Street, at 6:44 p.m.
Animal-control officers removed five pit bulls from the house. Small said that the crime scene was gruesome and that the house was "a mess," filthy, and reeking of dog urine. Small said police had received preliminary information that the dogs had attacked neighbors in the past. He said "everyone on the block" would be questioned. Gus Castro, 25, who lives across the street, said he was attacked on Friday when the dogs got loose in the neighborhood. Castro showed reporters numerous bite wounds on his legs, arms, and hands. 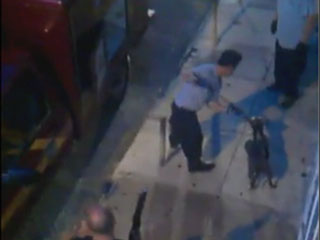 He said that the dogs were known to be vicious and that they also attacked an elderly woman nearby, at Fifth Street and Erie Avenue. Castro said animal-control officers had removed the dogs. "About three or four days later, they gave them back," he said. NEW HAMPSHIRE -- A city resident suffered multiple dog bites to his face, body, arms and legs Tuesday night when two pit bulls attacked him, police said. Dwayne Perry, 43, escaped the 7 p.m. attack only by ducking into the Domino's Pizza on the corner of Lowell and Maple streets, said police Lt. Jim Flanagan. “Apparently the pit bulls escaped 244 Lowell St. and immediately attacked him,” Flanagan said. Witnesses saw the two dogs return to 244 Lowell St., where police confronted the two residents of Apt. 1, Deeanna Hennessey and Jennifer Caterino. The two had no licenses or evidence of vaccinations for the animals. Police confiscated the dogs and took them to the Manchester Animal Shelter, Flanagan said. Flanagan said Perry, who lives at 20 Orange St., was treated at the hospital for the wounds. State law requires that dogs involved in an attack be quarantined for 10 days. NORTH CAROLINA -- WECT has learned that a 9-day-old baby has died after a dog attack in Clarkton. Officials say the 9-day-old baby girl was attacked by one or more dogs Tuesday afternoon. A call to EMS came in around 4 pm. Crews took the baby to Bladen County Hospital in Elizabethtown, but she died from her injuries. The Bladen County Sheriff's Office is working with the District Attorney on the investigation, to determine exactly what happened. The North Carolina State Bureau of Investigation has been called to help process the scene and interview witnesses. No charges have been filed in connection to the attack. 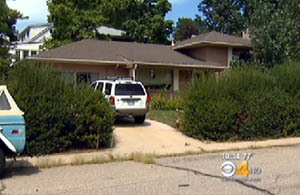 COLORADO -- An 8-year-old boy has bite wounds up and down his body after a neighbor's dog attacked him, and the boy's parents and residents in the neighborhood were upset at the response by authorities on Tuesday. However, on Tuesday night the owner of the dog had been cited and the dog was impounded, according to Lakewood Police. Police say the owner was also given a court summons and the dog will remain impounded until the man appears in court. 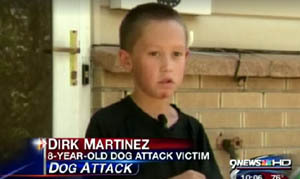 Dirk Martinez was attacked on Monday near Florida Avenue and Sheridan Boulevard when the dog, a German Shepherd, broke through its gate and went for the boy. "I screamed, 'Help me, help me,' three times," Dirk said. "I was walking to my friend's house to get my bike back. I heard banging. The dog jumped me. Jumped on my shirt and started yanking me." 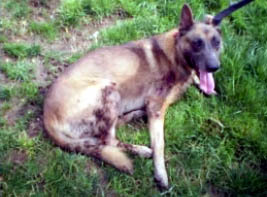 His pants and shirt have large holes in them and Dirk has bite marks, scrapes and bruises from his chin down to his calf. "Nobody is doing anything about this," Stefanie Martinez, Dirk's mother, said earlier in the day before the owner was cited. "I'm just so pissed." Martinez says police did not respond on Monday night, but Lakewood Animal Control did. However, she says no citation was issued and animal control did not take custody of the dog on Monday. "All of our kids play on this street. Everyone is terrified," she said. "Just a scary, scary situation," Anna Martinez, a neighbor who is not related to the family, said. 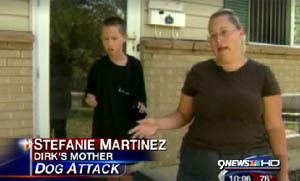 Anna Martinez lives two houses away from where the dog lives. She saw the attack. "It all just happened so fast," she said. "He was screaming, 'Help me, help me.'" She says a man who was in the neighborhood drove up to the attack and scared the dog away, but not before he was bitten himself. Anna Martinez has two young children of her own and says what happened is unacceptable. "Hopefully it gets put down," she said about the dog. "I hope the dog goes dead," Dirk said. "I'm scared. I never want to go back down there. I don't like German Shepherds." Dirk is recovering. He is sore and is on antibiotics in case of an infection, but otherwise his mother says he is doing fine. Lakewood Animal Control was at the location on Tuesday but refused to talk to 9NEWS. Neighbors say there has never been a problem with this dog before. While 9NEWS was talking to the Martinez family, the dog's owner called, apologized for what happened and took full responsibility. He also gave the Martinez' his insurance information. He was out of town and the dog was being watched by a neighbor. FLORIDA -- Broward Sheriff's Office deputies reportedly shot and killed two dogs after they say the canines attacked a woman and tried to come after them. According to BSO, two pit bulls in a Deerfield Beach neighborhood attacked a neighborhood cat, Monday evening. The cat's owner intervened, and the dogs began mauling her. "Apparently, these pit bulls came into her yard and started attacking at least one of her cats and then began attacking her," said Dani Moschella of BSO. When BSO deputies responded to the scene, the dogs charged at an officer. Deputies fired several shots at the pit bulls, killing them. Moschella said, "Multiple deputies were forced to fire their weapons and kill the dogs when the dogs became aggressive toward them." Witnesses like Chris Goldbach thought the gunshots they heard were fireworks. "At first, I saw one police car over there, and all of a sudden, I saw the police tape, and I was worried that maybe it was a kid in the neighborhood," Goldbach said. Some of the bullets struck a nearby home; one bullet went through the windshield of a truck parked in Evan Samdahl's driveway. "My neighbor always has her kids out playing on the sidewalks here back and forth, so I'm just thankful there were no kids outside," said Samdahl. "I love pit bulls, but an aggressive-breed dog needs to be secured." The 53-year-old victim was transported to an area hospital, suffering from bite wounds to her arms, abdomen and foot. Her arm was particularly left shredded by the attack. Now she fears for her cat. She believes the cat may have died in the attack, but she did not see the body and would like to find the remains to give her pet a proper burial. 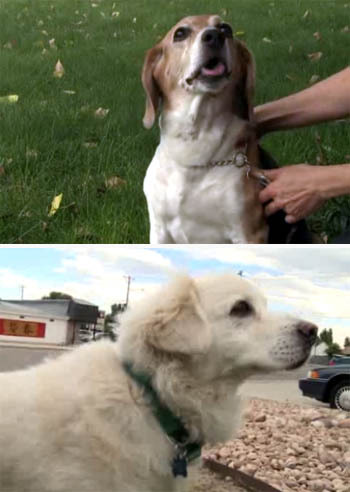 After the shooting, the dogs' owners arrived at the scene and claimed the animals. It is unknown if he will face any charges. TEXAS -- A Waco woman was sentenced to probation Monday in 19th District Court after she pleaded guilty to aggravated assault with a deadly weapon and endangering a child. Tomeka Davidson, 34, was arrested in February after police officers discovered her four children living in a home that was filled with animal waste and trash. Officers reported the home had no running water or natural gas service. She was also arrested in August 2010 and charged with aggravated assault with a deadly weapon after her pit bull dogs attacked a group of people walking in her neighborhood. State District Judge Ralph Strother ordered a pre-sentence investigation and after it comes back to the court he will set terms of her probation. WASHINGTON -- Everett police officers shot and killed a pit bull Monday night after it reportedly attacked them and a police dog. Around 11 p.m., police were called to help with crowd control at a fire in the 3200 block of Rucker Avenue, Sgt. Ryan Dalberg said. The police dog and its handler were checking the area when they found a man in an alley holding on to a large pit bull by the harness, without a leash, Dalberg said. Officers ordered the man to take the dog away from the area. The man refused and became belligerent. Officers began to arrest the man for obstruction, but they first ordered him to give the dog to a woman who was with him, Dalberg said. When the officers went to put handcuffs on the man, he fought back. The pit bull broke free from the woman, Dalberg said. The pit bull bit the police dog and then latched on to its handler, biting the officer on one of his thighs. Officers first tried to use a Taser on the dog, without effect. He then shot the pit bull with his handgun. The dog let go, but then began charging other officers, Dalberg said. One officer had to climb onto a patrol car to avoid being bitten. Several more shots were fired by the officers, and the dog eventually died. 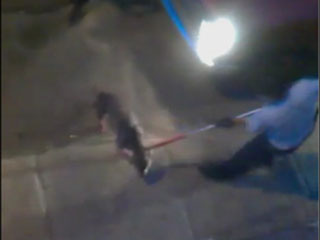 During the scuffle, the dog's owner also was Tased. He was arrested and booked into Snohomish County Jail for investigation of third-degree assault. The officer who was bitten was treated at a local hospital for minor injuries. The police dog was treated by a veterinarian and later released, Dalberg said. Unlike a shooting involving a human, where policy requires officers to be placed on leave, the officers involved in this incident remain on duty. Monday marked the second fatal shooting of a pit bull in Everett this month. On Aug. 17, a man shot his neighbor's pit bull in the 7100 block of Lower Ridge Road in Everett. The man told police the dog had charged him and his daughter. The fire on Rucker on Monday night remains under investigation and its cause is undetermined pending further interviews, Everett Fire Inspector Eric Hicks said. The fire broke out in the living room of an abandoned house. It was contained to the living room. Investigators believe squatters may have been living in the house, Hicks said. COLORADO -- On Monday morning at approximately 10:00 am, Evans Police Officer Kauffman and Evans Animal Control Officer Augustine were dispatched to the 3000 block of High Drive on a report of an animal attack, according to Evans Police spokesperson Rita Wolf. While en route, the Officers were advised a pit bull dog had escaped from his yard, jumped a fence and attacked another dog in its own backyard. Officers arrived on scene within minutes of the initial call to discover the pit bull had been fatally shot by the owner of shepherd mix dog that had been attacked. 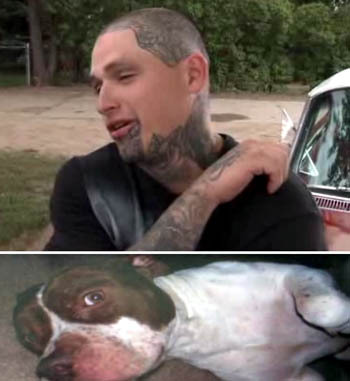 The brown and white pit bull by the name of Deuce had previously attacked two other dogs and the owner, Robert Delarosa had been issued citations according to the press release. 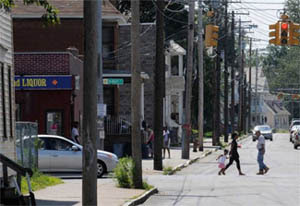 On July 22, 2011 Delarosa was cited with dog at large and no license for Deuce and another pit bull running loose from his premises. 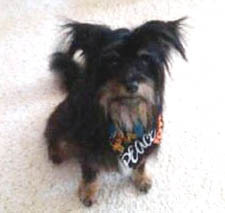 On August 5, 2011, Delarosa was cited for nuisance animal and dog at large as Deuce had somehow gotten out of his backyard and attacked a small male beagle that had sustained wounds to the face, ear, and legs. 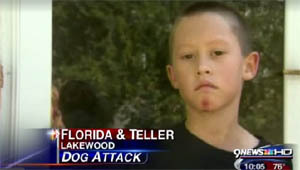 On August 9, 2011, Deuce once again attacked another dog, while the owner was walking his 12 year old dog, Atticus. Deuce was placed on home quarantine until Animal Control Officer Augustine picked Deuce up on August 10, 2011 and Deuce was taken to the Weld County Humane Society where he was placed on quarantine and was cited for Animal at Large and Vicious Animal on that date. Deuce was released to Delarosa on August 21, 2011 pending municipal court for all the above charges. Delarosa had moved to a different address when this subsequent attack occurred with Chief, a 6 year old Shepherd mix. Deuce jumped the fence in his backyard and jumped into the dog run where Chief was in. Wolf says Chief's owner heard all the commotion in his backyard and ran to Chief's aid. He attempted to separate the dogs and eventually shot and killed Deuce in order to free Chief. Chief sustained minor puncture wounds to the chest area, front legs, and the rear thigh area. Delarosa was cited with Unlawful Ownership of a dangerous dog. CALIFORNIA -- A young girl attacked by a pit bull in a City Heights neighborhood spoke to 10News about her terrifying encounter. Sarah Villa-Vasquez can't stop thinking of the pit bull that broke from its leash in a yard in the 4500 block of Auburn Drive and attacked her. It doesn't help that the 6-year-old has bandaged reminders of the incident all over her face and body. Sarah said she was playing with a friend outside the yard when the dog started barking aggressively. "One of the fence pieces was broken and it got out from the crack and it started attacking me," she said. Natasha Villa, Sarah's mother, was two houses down when the attack happened and recognized her daughter's scream immediately. "She had a pool of blood all over her shirt, on her shorts," said Villa. "There's still some blood on her shoe." The attack happened outside David Powell's home. He said he's not the owner of the dog, but has been watching over it recently. Powell was bitten in the hand while trying to control the situation. Witnesses at the scene said Powell's daugher, who Sarah was playing with, was also bitten, but Powell said she merely had some scratches. County Animal Services is investigating whether to charge Powell with a crime. The county now has custody of the dog, which will likely be euthanized. A decision will be made in the next 10 days. 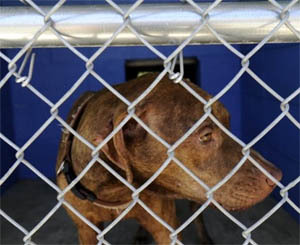 The county said out of nearly 2,700 dog bites from June 2011 through July 2010, 389 involved pit bulls -- nearly 15 percent. 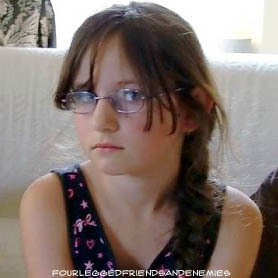 Sarah said she doesn't know how many stitches she received and when she'll get them removed. What she does know is she hopes no one else experiences what she did. "I think [the dog] should be put down because I'm afraid it'll happen to another kid. I don't want that," she said. CALIFORNIA -- Four people, including a 6-year-old girl who suffered a bite to the face, were recovering Monday after being attacked by pit bulls in City Heights. In the first incident, animal control officers were called to a home on Auburn Drive off Euclid Avenue at 11:30 a.m. by an emergency crew attending to the girl, Lt. Dan DeSousa of the county’s Department of Animal Control Services said. The girl had been at the house playing with the daughter of the dog’s owner when the animal, chained outside, attacked her, DeSousa said. The startled child then threw candy at the dog and it broke free and bit her again on the arm. The owner was bit in the hand as he intervened, and his daughter also suffered a minor bite to the right shoulder, DeSousa said. The 4-year-old dog, a 65 pound male named Cass, was taken to the Gaines Street animal shelter where it was to be tested for rabies and be quarantined for 10 days, he said. The department’s investigation will determin if the dog will be returned to the owner or euthanized, DeSousa said. Factors that will be considered include how many times the dog has bitten before, the severity of the injuries it inflicted and how responsible the owner is, he said. Officers were told conflicting stories as to how the dog had come to live with the family. The owner told animal control officers he only had the animal for four or five days. The person who he said he got the dog from disavowed any knowledge of it, DeSousa said. DeSousa said it is against state law to keep an animal chained to a stationary object more than three hours a day. He said an animal that cannot flee when scared or confronted will attack because that is its only option. “You can take a good dog and make it bad by chaining it, and take a bad dog and make it even worse,” DeSousa said. The second dog attack was reported about 7:30 p.m. Sunday. The victim said he was on 39th Street near Thorn Street when he was bitten on the arm by a pit bull that was running loose. He described the animal as “mostly black with a little white,” DeSousa said. He did not know if the dog was male or female. Animal control officers searched the area but did not find it. Officers will patrol the area for the next 10 days to see if they can locate the dog, DeSousa said. MISSISSIPPI -- A dog attacked a child Friday afternoon in Columbus, sending him to the hospital and prompting area law enforcement officials to take a closer look at the city's leash laws and vicious-dog ordinance. Interim Columbus Police Chief Selvain McQueen said at approximately 4:12 p.m., a 10-year-old was riding near the intersection of 13th Avenue and Fourth Street South when he was knocked from his bike by a dog described as a "pit-bull mix." Witnesses told police that after the child fell to the ground, the dog continued to attack, "going for his face and neck." The dog fled back to its house when a bystander threw a 40-ounce beer at it. Police cited dog owner LaTracy Williams, 30, of 1224 Fouth St. S., for having a nuisance dog, allowing the dog to run free and having no vaccination tag or identification for the animal. 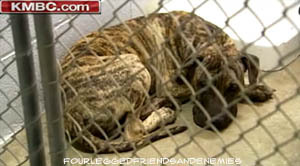 The dog was taken to the Columbus-Lowndes Humane Society for a 10-day observation hold. The child was taken to Baptist Memorial Hospital-Golden Triangle, where he was treated for bite wounds and released. McQueen said all dogs within the city limits are required to be confined to a house or pen and adhere to local leash laws. In addition, owners of pit bull and Rottweiler breeds -- whether kept inside or outside -- must register their dog with the Animal Control Office at the Columbus Police Department. By state law, all dogs must also have a rabies vaccination and tag. The fines for failure to register a pit bull or Rottweiler are $10 for a first offense, $20 for a second offense and $40 for a third offense. The fines for having no proof of vaccination are $25 for a first offense, $50 for a second offense and $75 for a third offense. 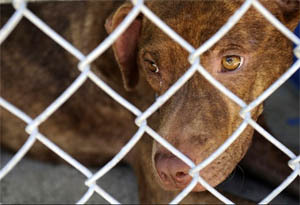 He said while the department and its three animal control officers work hard to make sure the laws are enforced, he intends to start cracking down harder on dog owners who fail to comply. "We are looking into these issues," McQueen said. "It would be a real smart thing for citizens to make sure dogs ... are in compliance." Oktibbeha County is looking into creating a vicious-dog ordinance, following the Aug. 13 attack of two children by five pit bulls and last summer's mauling of five cows. Citizens are expected to attend a Sept. 5 meeting by the Oktibbeha County Board of Supervisors to request action. TENNESSEE -- She's nameless for now. Ageless, too. And she has an imminent death sentence. Just when is not certain. The pit bull mix that authorities say tore 11-year-old Brandon Williams' ears from his head during an Aug. 3 attack will remain quarantined at the Newport Animal Shelter until a judge approves its euthanization, authorities said Tuesday. 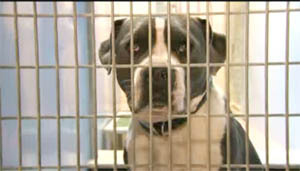 "We're holding it, pending on the court case," said Brandy Hensley, director of the shelter off Humane Way in Newport. "When we take a dog in, we have to hold the animal until the judge signs off to put it down." Brandon was mauled by the female and a large black male dog outside a home on Branch Drive in Newport as he carried a wrongly delivered UPS package to a neighbor's home. The fifth-grader spent a week at the University of Tennessee Medical Center where he underwent reconstructive surgery in an attempt to reattach his ears, which doctors could not save. Doctors also performed surgery on his neck, leg and arm. Cocke County Sheriff's Office deputies said the dogs were owned by Jennifer R. Switzer, 21, and Anthony L. Lugar, 22, who were arrested on charges of allowing animals to run at large. Both defendants, free Tuesday on $15,000 bond, were initially set to appear before General Sessions Judge John Bell on a preliminary hearing Aug. 29. But Fourth Judicial District Circuit Assistant Public Defender Brad Davidson said that during an arraignment last week he waived both their respective cases to a Cocke County grand jury that is slated to meet this fall. A tentative criminal court arraignment is set for Nov. 7. Davidson said he expects the pit bull mix will be put down, but that it would likely not take place until a formal criminal hearing takes place. He could not comment directly on the defendants' cases. During the attack, Brandon's father, Tony Williams, tried to grab the pit bull as it dragged Brandon down the road by one ear. The black dog intervened and bit him. Williams said he scared it off and then went after the pit bull. A neighbor fatally shot the black dog. 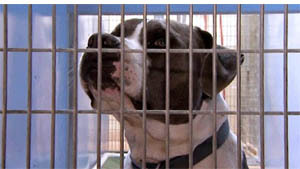 The female pit bull mix has been quarantined at the shelter since then. Shelter workers said this week they are not sure how old the dog is or what her name is. Brandon's father said neither of the dog's owners has contacted his family to see how Brandon is doing. But Switzer's mother did bring the boy a get-well card last week, he said. "He's healing fine and doing real good," Williams said. Whether it's to see a plastic surgeon, orthopedic surgeon, oral surgeon or an ear nose and throat doctor, Brandon's family drives from Newport to Knoxville and Maryville and back about three times a week. After the attack Brandon's aunt, Tammy Phillips, started a fund to raise money for her nephew from her home in Chattanooga. She planned to give him the full amount she's raised next month, but said she dropped off $675 this past weekend to help Brandon's parents with gas money. Brandon has a few options to help him live a more normal life without his ears, his father said. Doctors can attach removable prosthetic ears. Or they can create prosthetic ears to be inserted under his skin. The only problem with that option, his dad said, is the potential for infection. So his family is leaning toward a third option. "They can take a bottom rib and mold an ear out of the cartilage and then put it under the skin," his dad said. "They'll do it with two ribs, one for each ear. 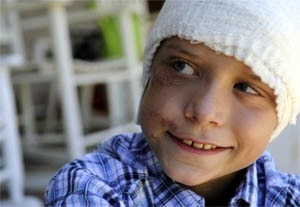 It could take a few years (to finish) the surgeries, but it's better because it's a part of his body." For now they have time to make a decision. Doctors want him to heal during the next six months to a year before they start reconstruction. An added plus? the Shriners organization plans to foot that bill, according to Williams. "They contacted us and said they have a plastic surgeon in Cincinnati that could do it and they'll cover everything," Brandon's dad said. "We've filled out the paper work and we're waiting on them schedule an appointment so he can be examined." CALIFORNIA -- A dog bit two girls and was shot by deputies when it turned on them, a Riverside County sheriff's lieutenant said today. Lt. Terrence Tingle said a report of a "vicious dog" was made about 7:30 p.m. Tuesday at a shopping center on 48th Avenue, east of Jackson Street. "Officers learned the dog ... attacked two girls walking on the south sidewalk of 48th Avenue," Tingle said. "Officers found the dog outside a nearby restaurant and attempted to contain it while awaiting an animal control officer. The dog attacked the officers, compelling an officer to shoot the dog." A 9-year-old girl was treated at Desert Regional Medical Center for a serious leg wound, and a 12-year-old girl was taken to a hospital by a family member for treatment of what were described as minor injuries, Tingle said. The dog did not die when a deputy shot the 2-year-old male pit bull mix with a handgun, the lieutenant said. The animal, which was subsequently euthanized, had no identification tags or microchips, according to Riverside County Department of Animal Services spokesman John Welsh, who said rabies testing would be done at a local lab. Riverside County Animal Services Officer James Huffman found the dog hiding underneath some bushes near a Taco Bell restaurant on Tuesday night, Welsh said. "He used a catch pole for his and others' safety when he impounded the dog. The dog suffered wounds to a front leg and one of its rear legs," he said. The sheriff's department investigates all incidents in which an officer discharges a firearm, Tingle said. Anyone with information about the dog attack is urged to call the sheriff's department at (760) 863-8990 or (760) 836-3215. TENNESSEE -- A dog that attacked local dentist Dr. Teresa Larkins and her own dog on Sunday, Aug. 7, was finally turned over to the authorities Tuesday afternoon after its owner reportedly sent the dog out of state to avoid it being quarantined by the Lebanon Police Department according to city and state laws. At approximately 12:07 a.m., Sunday, Lebanon officers responded to a call about a dog attack at 404 Amarillo Drive, discovering that Larkins and her dog had been reportedly viciously attacked by a Rottweiler. Larkins explained that she and her son had just arrived home from a trip to Kentucky and she was letting her Miniature Schnauzer out to use relieve itself. She said the Rottweiler attacked them both until her son had to fire gunshots to get the dog to leave. “The dog was vicious. This was a horrible, horrible attack,” Larkins said. Larkins received a severe laceration to her chin, requiring 30 stitches and was treated at University Medical Center in Lebanon. She also suffered wounds on her hand as well. 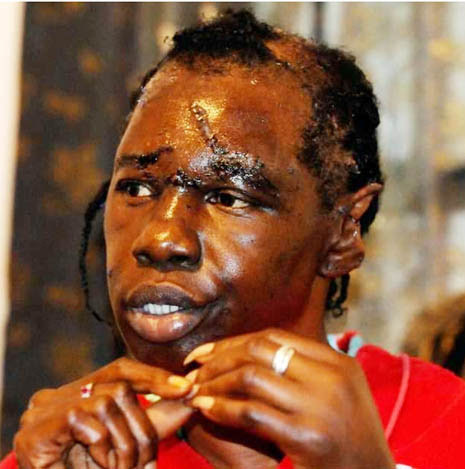 Larkins’ dog was treated at a local veterinarian’s office with lacerations. The dog responsible for the attack was a Rottweiler owned by Michael K. Turner III, 28, of 402 Amarillo Drive, who admitted to police he had a Rottweiler, but refused to let officers take custody of the dog. Officers explained the dog must be quarantined after biting someone according to the Lebanon Municipal Code. Officers returned to Turner’s home on Monday, Aug. 8, and again informed Turner the dog must be quarantined according not only to the Lebanon Municipal Code, but also per Tennessee Code Annotated. “I have been afraid to go outside with my dog,” Larkins said, adding that she was relieved the Rottweiler was finally picked up by Lebanon Animal Control on Tuesday afternoon. Turner told officers the dog had been sent out of state, and officers placed him under arrest for violating TCA 68-8-110. After being arrested, Turner reportedly stated that he could have the dog brought to the authorities within minutes. Turner was transported to the Wilson County Jail and charged with Hiding or Concealing an Animal. Turner made bond and was released from the jail on Monday. Also that day, officers cited Stephanie Beggs, 26, also of 420 Amarillo Drive, for allowing the Rottweiler to run at large, for keeping a vicious dog and not allowing the dog to be quarantined. Beggs was previously cited on June 5 for allowing the same Rottweiler to run at large after the same victim and her dog were almost attacked. Beggs was scheduled to appear in Lebanon City Court for the June citation today. Larkins said in June, she was outside with her dog when the Rottweiler came over into her yard and was reportedly being aggressive. She went to the neighbor’s home and tried to get someone to come outside and get the dog, but said no one came to the door. She then called Animal Control and the police issued Beggs a citation for having the Rottweiler running at large. Larkins said later that day, an officer had to physically hold the dog while her own dog was outside. “The police officer was holding the dog by the collar on my porch,” Larkins said. She said the wounds on her hand have prevented her from working this week and said she will not be totally relieved until the animal has been destroyed. The Police Department has been in contact with the District Attorney’s Office in reference to obtaining a petition to have the dog destroyed due to the attack on Larkins. A Wilson County judge ordered Friday that a Lebanon woman’s Rottweiler be destroyed after two separate attacks. Stephanie Beggs, of 402 Amarillo Drive, was cited for allowing "Roxy" to run at large June 5 and Aug. 8. In the August incident, she was also cited for keeping a vicious dog and not allowing the dog to be quarantined. She pleaded guilty to both incidents and was charged with more than $400 in fines. The dog has been released to Wilson County Animal Control to be put down. OREGON -- Portland police say the pit bull shot and killed by a transit officer had a history of aggressive behavior. Lt. Robert King says officers went to a bus stop at North Lombard and North Interstate around 4:30 p.m. Wednesday after reports that a man was trying to bring his dog on a bus. Officers identified the man as Richard Cook. According to investigators, Cook was extremely drunk when they contacted him at the bus stop. King says Cook's dog, a pit bull, was off-leash at the bus stop and was not muzzled. Officers say Buddy, the pit bull, was required to be muzzled and on a leash when he was out in public. The requirement stemmed from two incidents in 2010 in which Buddy bit two people, including a 2-year-old girl. In the first case, officers responded to Southeast 38th Avenue and Southeast Hawthorne Boulevard on reports of a dog bite. When they showed up, they found the girl has been bit by Buddy. Cook went to jail for a warrant and the dog was taken by Multnomah County Animal Control. On Dec. 15, 2010, police responded to a report of a pit bull that had bitten a skateboarder at the same location as the first incident. Officers say they learned on this occasion that Buddy used to be a fighting dog. Animal Control told Cook on June 2 that because of the other bites, the pit bull was required to have a muzzle at all times. Police said Cook refused and was cited for having a dog as a public nuisance. On Wednesday, the officer who shot Buddy told Cook to get control of the dog but Cook failed to do so, King says. The pit bull "aggressively advanced on the officer and the officer tried swatting the pit bull away but the pit bull continued to be aggressive and attempted to bite the officer," King says. The officer fired two shots and killed Buddy, officers say. King says witnesses told officers that Buddy was being aggressive with three other people before officers arrived. Cook was in Multnomah County Court on Thursday afternoon. He did not enter a plea and refused to have an attorney appointed for him. The judge determined there was enough probable cause to hold Cook in jail until his next court appearance on Sept. 1. CALIFORNIA -- A Paradise woman who called Action News when her dog was stolen last October during a home burglary.. is reaching out once again. Her dog Benjamin was brutally attacked last Sunday.. And now she's hoping to send a message about the importance of leash laws. "And then I hear him screaming!" Joanne Graham was in the back yard of her Paradise home Sunday, when her 2-year-old pug Benjamin was attacked by a neighborhood dog. She heard him screaming, dropped everything, and ran. "The rottweiler had Benjamin and was trying to kill him." After Graham shouted no, over and over, the dog dropped Benjamin. She grabbed her dog and ran..
Knowing time was crucial for his survival. "He was already bulging out and he had big cuts on his back where her teeth had been in deep.."
She rushed him to the North Valley Emergency Veterinary Clinic in Chico. Where he was operated on for four hours. And about a hundred stitches later, he was released. "He's very lucky to be alive." Graham called the police department Monday morning, to tell them she's seen the dog wandering around the neighborhood without a leash many times before. Paradise Police Lieutenant Al Billington says, since then, the owner was cited for having a 'vicious dog.' And will need to pay up to $500 for having it off leash and unattended. "I think the minor consequence is the infraction.. The other consequences are if the dog gets loose, attacks a child, attacks another animal.."
Billington also says the town of paradise has a leash law in place to prevent incidents like this. "It's really for the safety of the public and the animal itself." Graham says she hopes others will learn from this tragedy. And hopes it might prevent other attacks in the future. Meanwhile, she's thankful Benjamin is alive and well. "He's the best little dog and people love him!" Just this afternoon, the owner of the rottweiler has offered to pay Graham for all of Benjamin's veterinary bills.. Which are close to $4,000 so far. As for Benjamin, he will be resting for least two weeks, but is expected to make a full recovery. UNITED KINGDOM -- Police are investigating an incident during which a Newport man said his cat was fatally mauled by a dog. 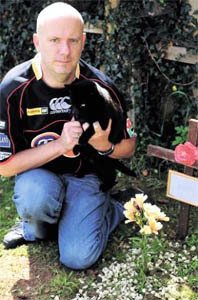 Gareth Jones, 45, claimed he was threatened by a man after a cross breed bull mastiff came into his front garden, dragged his 12-year-old cat Tiger from their front doorstep and attacked her in the street. Mr Jones, of Dents Hill, said he kicked the dog away to protect his pet. He said the attack left Tiger with eight puncture wounds to her abdomen and two broken back legs, and she had to be put down the same day. Mr Jones said his family, including wife Michelle, 44, and daughter Peyton, 14, are devastated, and were frightened by the incident. The matter was reported to Gwent Police and a spokeswomen for the force said it was investigating a public order offence. WISCONSIN -- Police today are looking for a teenager whose dog attacked another dog Thursday in the 500 block of N. State Street. Police say the attacking dog, described as a black pit bull terrier, was tied by a leash to the teen’s bicycle about 6:45 p.m. when it pulled away and attacked a dog being walked by a 32-year-old woman. The teen was pulled off of his bicycle and was last seen riding north on State Street. The teen was described as Hispanic, about 16 years old, about 5 feet, 7 inches tall and between 160 and 185 pounds. He wore a black baseball cap, black jeans and a dark shirt. He rode a dark colored, BMX-style bicycle. The dog that was attacked required veterinary care. Anyone with information on the incident or the dog owner’s identity is asked to call the Appleton Police Department at 920-832-5500. KANSAS -- An 8-year-old boy has suffered serious injuries after he was attacked by a dog on Thursday night in Olathe. Olathe police said the attack happened at 6:21 p.m. at 212 South Chester Terrace. dog. Of course the dog is going to snap it! Police said the boy was bitten several times by a boxer/shar pei mix. The dog's owner said the boy was a friend of her son's. She said her son tried to kick the dog away, but the boy still suffered serious wounds to his arm and leg. The boy was taken to Children’s Mercy Hospital and was in serious condition. The dog was taken to the Olathe Animal Shelter and will remain there pending further investigation, police said. KMBC's Peggy Breit visited the dog at the shelter on Friday afternoon. Breit said the dog was growling and trembling while sitting in a cage. Breit reported that this wasn't the first time the dog attacked a child. On Aug. 15 a 9-year-old suffered a minor hand wound, and that police and animal control had been trying to reach the owner of the dog ever since. Because the bite was minor, there was no probable cause to take the dog, Breit reported. Anyone with information on the attack or who witnessed the attack was asked to call police at 913-971-7455 or 816-474-8477. TENNESSEE -- Two Midtown dog owners are livid after their dog was attacked by a pit bull Thursday night, and they say Memphis Animal Services didn't do anything about it. Brian Sanders and his ex-girlfriend, Sokhom Chanthavilay, were walking their German shepherd in the Sanabel Apartments where Chanthavilay lives when they say a neighbor's pit bull attacked their dog, Jackson. "Jackson had his muzzle on and he couldn't defend himself," Sanders said. Both the owner of the attacking pit bull and Sanders began hitting the dog with a board until it was pried off of Jackson by an onlooker, Chanthavilay said. Sanders called police, who in turn called Animal Services, but when the animal control officer arrived Sanders said she told him the pit bull couldn't be taken in because it didn't bite a human and there wasn't enough room in the shelter. Mary Cashiola, spokeswoman for the city of Memphis, said the animal control officer complied with policy in not taking in the dog because "both the owner and the police advised the ACO that the German shepherd was not seriously wounded." However, Sanders says his German shepherd was taken to a veterinarian overnight at a cost of $515 and several stitches. 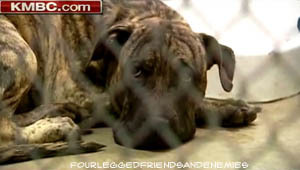 Later Friday, Cashiola said the dog had been impounded at the shelter. [NOTE: Prime example of laziness on the part of the animal control officer. Either s/he is a complete moron and doesn't know the laws s/he is supposed to enforce or s/he is completely lazy and doesn't deserve his/her job. Only after media inquiries did the animal control officer finally do the correct thing and impound the dog. No, it doesn't need a rabies quarantine b/c it didn't bite a human. However, it needed to be impounded in order to take the owner to court to declare the dog vicious and try to have the dog put to sleep. You don't leave a vicious dog like this with the owner b/c owners, scared that the dog will be taken from them, will often hide the dog and then insist it "ran away". The owner of the pit bull was issued a citation Thursday for failing to have license and registration, as well as not being in compliance with the city's spay and neuter ordinance. OREGON -- A Portland police spokesman says an officer responding to a report of a man with an aggressive pit bull trying to board a bus fatally shot the dog near a north Portland bus stop. Lt. Robert King says that shortly after officers arrived at the scene Wednesday afternoon, the dog charged one officer, who evaded it without injury. King says when the dog charged again, the officer fired and killed it. Late Wednesday, police identified the dog’s owner as 61-year-old Richard Cook. They arrested him for investigation of four misdemeanors, including disorderly conduct and reckless endangerment. An employee of a gas station next to the bus stop tells The Oregonian the dog’s owner was a regular at the station’s convenience store and the pit bull was always friendly. Another woman told the newspaper she frequently saw the man and dog riding the bus and the dog was well-mannered. 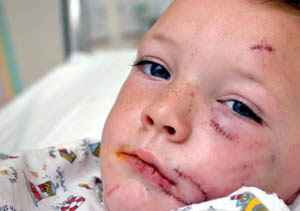 UNITED KINGDOM -- Seeing the most horrific injuries – some too terrible to show in this paper – suffered by five-year-old Karl “Mitch” Morson who was this week mauled by a Rottweiler, he’s lucky to be alive. That’s what his mam Lisa, 30, and grandad Dave, 70, know as they look at the scarring to his face he will live with for the rest of his life. Lisa is still in shock, traumatised and having flashbacks of the horror that will live with her, seeing blood streaming from her son’s ravaged face. home by a Rottweiler dog. She went into such shock, she couldn’t do anything after pals he had been playing with raced to their Sulgrave home telling her that a dog had attacked him. Dave took the little fella, who had tried to fight off the dog which had pinned him to the ground, straight to Sunderland Royal. Looking at his terrifying injuries, it is amazing how skillfully Mitch has been repaired. Dangerous dogs in this country are on the increase and serious attacks on young children by savage dogs rose by 14 per cent in 2009. The dogs mauled 1,942 under-10s so badly they needed hospital treatment. And the majority of these savage attacks on children, including many babies and toddlers are by “family pets”. Now little Mitch is another statistic, another child who had the misfortune to be in the wrong place at the wrong time. So too was a young mother, who this week suffered severe hand injuries, saving her two children in another dog attack. Karen Greaves, 31, fended off a bull mastiff that had killed their King Charles spaniel puppy, then leapt at her four-month-old daughter’s buggy as she picnicked in a Manchester Park with baby Amelia and Dylan, five. CALIFORNIA -- Taft Police shot and killed a pit bull in Taft Heights on Thursday after it was shot once with a Taser and two police officers and an animal control officer were unable to control it with nooses. It all started just before 2 p.m. when Animal Control Officer Tracy Bryan was dispatched to a report of a vicious dog on the 600 block on A Street. Lt. Ed Whiting said Bryan found the large pit bull attacking a dog being walked by its owner. 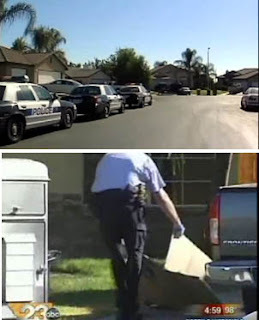 Bryan deployed her Taser, which administered a powerful electrical shock, and the pit bull released the other dog and fled into a back yard at 619 A.
Bryan tried to control the pit bull herself with a noose, Whiting said, but the dog was too strong. “It was a very large, powerful dog,” Whiting said. Bryan radioed for assistance and both Taft Police and Kern County Sheriff's deputies responded to the scene. Two Taft officers, Ray Buford and Moises Martinez, tried to help Bryan control the dog. At one point the two police officers and the animal control officer had two nooses on the dog but still couldn't control it, Whiting said. Fearing the dog was going to get loose just across the street from Parkview School with children about to be let out, one of the officers shot and killed the dog, Whiting said. It was the third time law enforcement officers have shot and killed pit bulls in the area in recent weeks. In June, a Kern County Sheriff's deputy shot and killed a pit bull that attacked him and last week another deputy shot and killed a pit bull that had a family trapped in a car in Derby Acres, then turned on the deputy. Earlier in the day off-duty Taft Police officer Veronica Sandoval shot and killed a pit bull in the yard of her Bakersfield home. UNITED KINGDOM -- Mimi Kitch, aged nine, was visiting her grandmother in Uphill, Weston with her mother, Sharon Kitch, aged 37, when the incident occurred. They had decided to take two dogs, which belonged to grandmother Susan Richards, for a walk in the field next to the Uphill cricket ground. Mrs Kitch said when Mimi crossed the gate to enter the field a boxer dog ran towards her and then bit her left leg, leaving three deep puncture wounds. Sharon Kitch said: “It was like a nightmare. Mimi was so scared and it was horrible to see her like that. Mrs Kitch said Mimi was looking forward to visiting her grandmother and to see her new dogs. When they arrived at the field, Mrs Kitch said she saw a man with his two children and two dogs. When the boxer dog attacked Mimi, her mother’s staffordshire bull terrier head-butted the boxer dog, and was then attacked by it also. 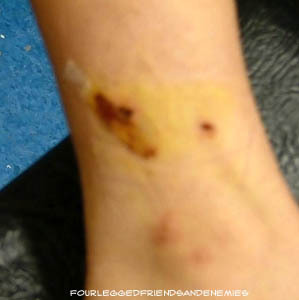 Mimi’s wounds were very close to the bone and she had to have a stitch and anti-biotics specifically for a dog bite. Mrs Kitch reported the incident to the police but so far they have not been able to find the man or dog. Mrs Kitch described the boxer dog as brown, with a white chest and a light brown brindle strip. She said he is a very distinctive looking dog as he is very skinny and looked poorly treated. 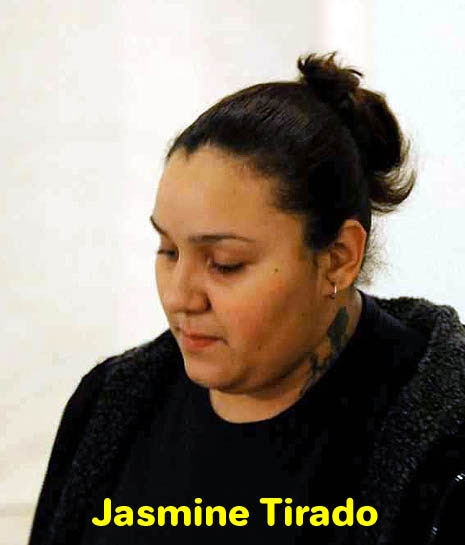 She described the owner as a stocky-built man, around 5ft 10inches tall, with short brown hair. 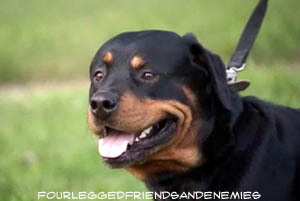 UNITED KINGDOM -- A WIRRAL man was left devastated when his pet dog was mauled to death by a Rottweiler. Nick Clarke, from Leasowe, could only watch in horror as the dog tore into Yorkshire Terrier "Minnie". Minnie was on her lead outside a small block of flats when the Rottweiler “charged” at her and launched its attack. 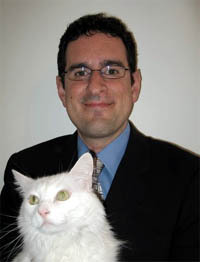 During his attempts to rescue his pet from the larger dog’s clutches, Mr Clarke sustained bites to his hands and was later rushed to hospital after suffering an angina attack. The dad-of-one, who had 13-year-old Minnie since she was a puppy, now wants to warn families in the area of the Rottweiler and is calling for stricter rules for dog-owners. Mr Clarke said: “I was standing in a communal area outside when this Rottweiler came charging at my little dog. He just savaged her and Minnie couldn’t escape. Mr Clarke believes action should be taken to prevent the dog from striking again. He added: “I haven’t been able to sleep properly since the attack. Merseyside Police confirmed the incident being reported. A spokeswoman said officers had spoken to all parties involved. 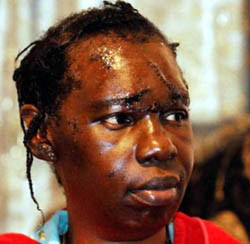 NEW YORK -- Even with three pit bulls tearing at her flesh, Shirleen Lucas never doubted she would live. "I was screaming for my life and saying, 'I'm not going out like this,'" she recounted Thursday from the living room of her city home, not far from the spot where the three dogs pounced on her early Monday morning. "It seemed like I couldn't scream loud enough." 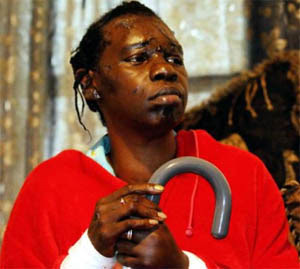 Her pastor, the Rev. Clarence Samuels Johnson of Refreshing Spring Church of God in Christ, who had come to check up on her, sat on a couch across the room listening to her story. The woman's harrowing ordeal began around 12:15 a.m. Monday when she left her Lincoln Avenue home to get money from the ATM at Zaid Discount near the corner of Albany and Hulett streets. On her way there, she spied one of the dogs prancing her way but was able to avoid the animal when it stopped in the street for a passing car. But coming back home would be a different story. She told her pastor she went against her religious premonition to take a different route and estimated she was about two car lengths away on the sidewalk when the first, and largest, pit bull began charging towards her. "He saw me and just took off and ran towards me," she recalled. She tried to dash for the front door of 348 Hulett St. to get help but by then the dog and a second, medium-sized one, had already knocked her to the ground when the third, and smallest, pit bull joined them. Lucas, 58, began yelling while desperately trying to fend off the animals with kicks and punches. When that didn't work and the dogs started dragging her, she used her hands to try and cover up her face and head. She then began praying. 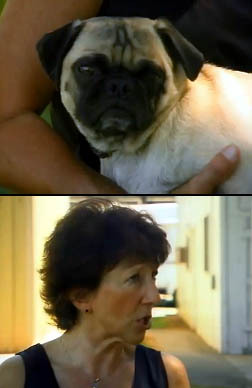 "The next thing I heard was a Taser and then the one dog that was on me sat up like he didn't do anything," she said. It was then that she heard the voice of a female, wearing tan pants and a white shirt, who she later found out was the owner, yelling to police, "don't shoot, don't shoot" to which Lucas responded, "shoot, shoot." Neighbors had called 911. Police tasered the most aggressive dog, and the owner, meanwhile, had gotten the other two off of Lucas, the victim said. 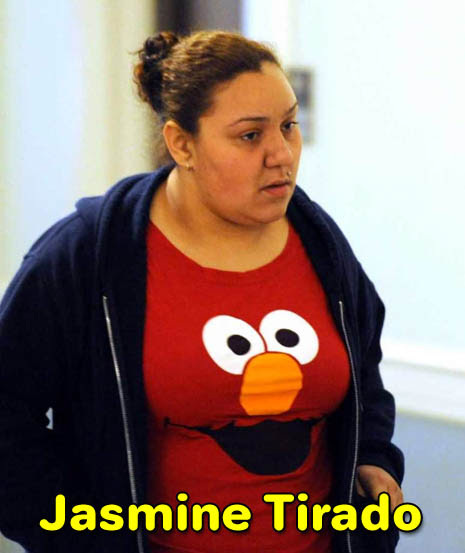 Police have identified the dog's owner as 21-year-old Jasmine L. Tirado (Jasmine Tirado) of 347 Hulett St. She has been issued appearance tickets for having one unlicensed dog as well as three separate tickets for harboring dangerous dogs. She is expected to be in court to answer to the charges on Sept. 12. Tirado could not be reached Thursday for comment. Two of her dogs, an adult male and female, were euthanized and will be tested for rabies by the state health department. The third animal is being held at the Montgomery County SPCA for 10 days and will then be euthanized. Lucas returned home Wednesday from Albany Medical Center Hospital around 6 p.m. in a lot of pain, for which she is on painkillers and antibiotics, with upwards of 200 stitches and staples to close gashes on her forehead and head. Her arms and legs are heavily bandaged, patches of missing hair reveal her skull, her ears are mangled and will need to be surgically repaired, and for the foreseeable future she will need a cane to get around. Still, she said she is thankful to God for being alive and hopes to regain her strength so she can see her 8-year-old granddaughter off to school on Sept. 6. "I know God answers prayers," she said. In the meantime, Lucas relies on her son Derrick, 35, and daughter, Darcelle, 28, as well as Barbara Hawkins, a member of her church, to care for her. She is scheduled to return to the doctor Tuesday. Lucas said she would like to see harsher penalties for dangerous dogs and aggressive breeds of dogs like pit bulls, particularly when their owners don't keep them under control. "I think pit bulls should be put in a zoo so they can be viewed from a distance," she added. But Brad Shear, executive director of the Mohawk Hudson Humane Society in Menands, said pit bulls "tend to be great family pets" and are "generally sweet and gentle dogs." "The issue is the way they are trained and the way they are raised because any dog can be turned into a vicious dog if they are not cared for properly," he said. He said pit bulls have gotten a bad name because too often they tend to be the dog of choice for individuals involved in illicit activity. "That breed of dog is popular because of the reputation it has as a vicious dog, which is not well deserved," Shear added. Bad shelter tag added to this article due to his ridiculous comments and the fact that he is the mouthpiece for the shelter. Though Lucas couldn't remember how long Monday's attack lasted, she said "it seemed like an eternity." In a light moment, she recounted how the smallest dog appeared to "carefully" slip the watch off her wrist. She hopes to get the time piece back and a sentimental bracelet she has worn since 1967, both of which were lost in the struggle with the dogs. NORTH CAROLINA -- The 32-year-old Mint Hill horse that was attacked by two pit bulls in January is a victim again. who was attacked by two dogs on the morning of Aug. 23. Two different dogs attacked Joker Aug. 23 while the female horse was roaming in her pasture off Dan Hood Road. Her injuries this time were more severe: about 100 puncture wounds and 60 stitches. And property owner Bill Williamson is wondering when the Town of Mint Hill will consider passing a “dangerous dog” ordinance to ensure pet owners are held accountable. Williamson, 63, suffered a heart attack in his front yard Feb. 1 after a neighbor’s two pit bulls chased and attacked Joker. Police used cardio-pulmonary resuscitation and a portable defibrillator to revive Williamson. The dogs, 2-year-olds named Hank and Gizmo, were classified as “dangerous” and were euthanized by Charlotte-Mecklenburg Animal Care & Control in May. Mint Hill commissioners decided then not to explore having its own dog ordinance. Williamson said he went searching for Joker after she didn’t come to the barn to be fed about 8 a.m. Tuesday. He found her standing by the pond, bleeding profusely from several deep wounds and saw two dogs, at least one of which was a pit bull, in the pasture with blood on them. He doesn’t know whom the dogs belong to. Animal Care & Control took more than three hours to respond to his call, he said. When the officer arrived she didn’t know that a horse had been injured, only that dogs were spotted running loose, Williamson said. That’s frustrating to the family, too. “Where is Animal Control? Where is this service we’re paying for?” he said. According to Animal Care & Control records, when Williamson called at about 8:30 a.m. he told dispatchers his horse had been attacked by two dogs but that they were no longer on his property, department spokeswoman Melissa Knicely said. This type of call provides for a four-hour response time, she said. An Animal Control officer arrived about 11:15 a.m. and after talking with Williamson, searched for the dogs until about 2:30 p.m. The officer didn’t find the dogs, but the agency has arranged to set up a dog trap on the property if the dogs return, Knicely said. A veterinarian had to amputate part of Joker’s ear mauled by the dogs and spent three hours sewing her mangled lip back together, Williamson said. She has bite marks under her thick mane and an open gash on the bottom of her neck that was too big for stitches. The veterinarian prescribed antibiotics and pain medication, in hopes the wound will drain and heal on its own, Williamson said. Joker belongs to Kris Keener of Lincolnton but the Williamsons have cared for her for more than 30 years. Keener kept vigil with Joker Tuesday and Wednesday. But after learning this week about the latest attack, Austin said he feels that Mecklenburg County animal ordinances are sufficient in Mint Hill. CALIFORNIA -- An off-duty Taft police officer shoots and kills a pit bull as it attacks her dog. Police say the officer awoke to sounds of dogs fighting in the back yard of her Bakersfield home. It happened in a quiet neighborhood near Wible and Taft Highway just after 8 a.m. Thursday. Police say when the Taft officer went into the back yard of her home to rescue her dog, the pit bull charged her, and thats when she opened fire. "This morning she was awakened by the sounds of possibly her dog being attacked by the neighbors pit bull dog," said Bakersfield police Sgt. Orbin Love. The officer grabbed her gun and fired multiple times killing the dog. "It appears she has had prior contact with the neighbor regarding the dog gaining access to her back yard," Love said. Neighbors say they are sad the dog was killed but they understand. "I'd do the same thing. Im animal lover, and I don't like to see animals attack each other," said one neighbor who asked not to be identified. I hear about a lot of dogs getting loose and a lot of dogs attacking people, and you know you have to have self-defense for your self and for your kids and for your other dogs," said neighbor Denise Ashley. Police say its a clear cut case of self-defense. Bakersfield police say it is legal to shot a dog in defense of your pet as long as you are legally carrying the gun. It appears at this time like she fired shots in self defense of herself, her family and her two dogs," Love said. Neighbors say loose dogs are a problem in the area. "I put my dogs on leashes, and sometimes we do see some loose dogs, and I get scared just in case one of the dogs was to attack my dog," Ashley said. Taft police say its not yet clear if the officer used her service weapon to shoot the dog. Bakersfield police say no charges will be filed in the case. COLORADO -- A pit bull that attacked and disemboweled another dog in an Arvada neighborhood was put down Wednesday. Arvada police confirmed that the dog owners euthanized the pit bull, and the landlords said they served an eviction notice because of the attack reports. Janelle Jerman was walking her 2-year-old Yorkie mix Uno on Monday night near 62nd Place and Yukon Court, when she said two pit bulls jumped out of a car window and attacked. "They grabbed my dog and disemboweled him right in front of me," said Jerman. "I just screamed for all I was worth. The neighbors came running and the owners of the dog did come and drag the dog off of mine." Her dog died a short time later, while in surgery. The story sounds all too familiar to neighbor Kimberly Greene. "It's just horrible that this happened to someone else," said Greene. Her West Highland terrier, Chloe, still has the stitches where her leg was amputated. Three weeks ago, Green said that the same pit bull that killed Uno attacked her dog. "The dog came out of nowhere, like a hawk attacking a mouse, and just got her and didn't let go," said Greene. 7NEWS Reporter Jaclyn Allen tried to talk to the owners, but they didn't answer the door. Arvada Police spokeswoman Susan Medina said police are still investigating what happened, but that if it's not a person who was attacked, police don't automatically remove dogs. She said a summons had been issued against the owners for the first attack. Jerman said she thinks Arvada needs tougher laws against aggressive pets, so that what happened to Uno doesn't happen to other dogs. "He brought me so much joy and so much happiness," said Jerman. "I did everything right. I took her to training. We walked on-leash. How do you prepare for something like this?" Some neighbors were relieved to hear the pit bull had been put down, but said it was too little too late. "That dog should have been hauled away the first time it attacked that first dog," said Lisa Briles. Briles said she and other neighbors have repeatedly called animal control to report aggressive behavior. "I had animal control officers tell me I needed to learn how to be civilized with my neighbors," said Briles. Arvada Police Spokeswoman Susan Medina said officers routinely see dog-on-dog attacks, and they are not treated the same as attacks on people, which is why the dogs weren't immediately confiscated. "They're due their day in court," said Medina. "We did operate within the perimeters of what our procedures are." Medina said after Uno was attacked, police gave the dog owners an option: a court order to euthanize the dog or take responsibility themselves. Medina said the owners put down the pit bull at a local animal hospital. Medina said the second dog involved in the attack was an Australian Shepherd, not a pit bull, and that while it did also jump out of the car window, it did not actually attack the other dog. Jerman said the dogs were working in tandem, and that the second dog was aggressively "herding" people to keep them away while the pit bull killed Uno. Police, who were canvassing the neighborhood Wednesday afternoon, said they were investigating charges against the dog owners.